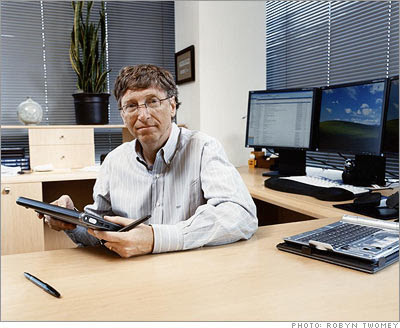 Bill Gates: This is how I work!! It’s pretty incredible to look back 30 years to when Microsoft (Research) was starting and realize how work has been transformed. We’re finally getting close to what I call the digital workstyle. I get about 100 e-mails a day. We apply filtering to keep it to that level—e-mail comes straight to me from anyone I’ve ever corresponded with, anyone from Microsoft, Intel, HP, and all the other partner companies, and anyone I know. And I always see a write-up from my assistant of any other e-mail, from companies that aren’t on my permission list or individuals I don’t know. That way I know what people are praising us for, what they are complaining about, and what they are asking. We’re at the point now where the challenge isn’t how to communicate effectively with e-mail, it’s ensuring that you spend your time on the e-mail that matters most. I use tools like “in-box rules” and search folders to mark and group messages based on their content and importance. Outlook also has a little notification box that comes up in the lower right whenever a new e-mail comes in. We call it the toast. I’m very disciplined about ignoring that unless I see that it’s a high-priority topic. Staying focused is one issue; that’s the problem of information overload. The other problem is information underload. Being flooded with information doesn’t mean we have the right information or that we’re in touch with the right people. Right now, I’m getting ready for Think Week. In May, I’ll go off for a week and read 100 or more papers from Microsoft employees that examine issues related to the company and the future of technology. I’ve been doing this for over 12 years. It used to be an all-paper process in which I was the only one doing the reading and commenting. Today the whole process is digital and open to the entire company. I’m now far more efficient in picking the right papers to read, and I can add electronic comments that everyone sees in real time. SharePoint puts me in touch with lots of people deep in the organization. It’s like having a super-website that lets many people edit and discuss—far more than the standard practice of sending e-mails with enclosures. And it notifies you if anything comes up in an area you’re interested in. Paper is no longer a big part of my day. I get 90% of my news online, and when I go to a meeting and want to jot things down, I bring my Tablet PC. It’s fully synchronized with my office machine so I have all the files I need. It also has a note-taking piece of software called OneNote, so all my notes are in digital form. The one low-tech piece of equipment still in my office is my whiteboard. I always have nice color pens, and it’s great for brainstorming when I’m with other people, and even sometimes by myself. The whiteboards in some Microsoft offices have the ability to capture an image and send it up to the computer, almost like a huge Tablet PC. I don’t have that right now, but probably I’ll get a digital whiteboard in the next year. Today, if there’s something up there that’s brilliant, I just get out my pen and my Tablet PC and recreate it. Days are often filled with meetings. It’s a nice luxury to get some time to go write up my thoughts or follow up on meetings during the day. But sometimes that doesn’t happen. So then it’s great after the kids go to bed to be able to just sit at home and go through whatever e-mail I didn’t get to. If the entire week is very busy, it’s the weekend when I’ll send the long, thoughtful pieces of e-mail. When people come in Monday morning, they’ll see that I’ve been quite busy— they’ll have a lot of e-mail. Symantec has thrown everything it has at Windows Vista. Backdoors, Keyloggers, Rootkits, Mass mailers, Trojan horses, Spyware and adware and also uncategorized binaries were all executed on Windows Vista. Symantec stated that it has used its own virus repository as well as those of security partners as sources for the binaries. 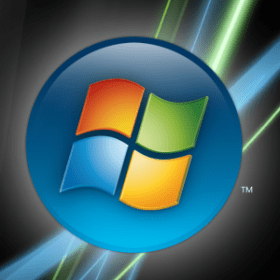 “The results showed that 3 percent of backdoors can successfully execute and survive a system restart on Windows Vista without modification. Other categories include keyloggers, of which 4 percent can successfully execute and survive a system restart, mass mailers (4 percent), Trojans (2 percent), spyware (2 percent), and adware (2 percent). Symantec believes that these percentages would increase dramatically with only minor code changes to make these threats Windows Vista–aware, in turn allowing them to run successfully within the new Windows Vista security model,” Symantec revealed. Well corporates like Symantec rely on the running of malicious things for their bread and butter and it really fouls up the needs for their product if the OS is strong and resilient enough to tackle majority of malicious thingies. However as the OS gets more torn apart there will be more vulnerabilities coming up which might get exploited. 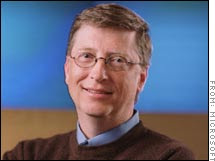 However its a jewel in the crown of Microsoft that their effort of making a secure OS has paid off. Microsoft released Vista after a long wait and it seems that they have done a good job ! The future of computing has arrived!! Remember when you were promised all those amazing future tech innovations? Just around the corner was supposed to be a shining technology utopia with flying cars, personal space travel to distant galaxies, and bio-implantable cell phones. Don’t lose hope! 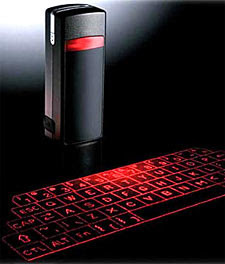 An amazing glimpse of this promised future has just arrived in the form of the Bluetooth Laser Virtual Keyboard. This tiny device laser-projects a keyboard on any flat surface… you can then type away accompanied by simulated key click sounds. It really is true future magic at its best. You’ll be turning heads the moment you pull this baby from your pocket and use it to compose an e-mail on your bluetooth enabled PDA or Cell Phone. With 63 keys and and full size QWERTY layout the Laser Virtual Keyboard can approach typing speeds of a standard keyboard… in a size a little larger than a matchbook. * Compatible with PalmOS 5, PocketPC 2003, Windows Smartphone, Symbian OS, and Windows 2000/XP. Limited Mac OSX Support.